Julie is a registered mental health nurse. Julie joined City, University of London in 1997 and she previously worked in community mental health services specializing in substance use problems and homelessness. She has undertaken research about the relationship between homelessness and mental illness, student preferences in assessment, the use of audio feedback for formative assessment, health students' use of mobile devices. She is currently working on a project investigating the impact of professional revalidation on academic staff identity. 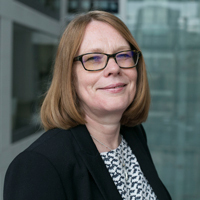 She is the Associate Dean, Director of Undergraduate Studies in the School of Health Sciences, working with a number of health services providers across London and the South East. Julie has undertaken research projects investigating student preferences for assessment modes, use of audio feedback in assessment and use of discussion forums by mental health service users. She has also investigated the relationship between homelessness, mental health and health risk behaviours. Julie is currently undertaking a project investigating health student preferences and compatibility for Mobile Learning (m-Learning) using a variety of mobile devices at City University London. Further information: Julie supervises MSc and BSc students across a range of research projects and dissertations. Callaghan, P. and Gamble, C. (2015). Oxford Handbook of Mental Health Nursing. OUP Oxford. ISBN 978-0-19-100885-6. Attenborough, J.A. (2009). Alcohol and Mood Disorders. In Phillips, P., McKeown, O. and Sandford, T. (Eds. ), Dual Diagnosis Wiley-Blackwell. ISBN 978-1-4051-8009-2. Attenborough, J.A. (2009). Mental Health Nursing. In Jones, P. and Bourgeois, S. (Eds. ), The Clinical Placement, A Nursing Survival Guide 2nd Edition Elsevier. Attenborough, J.A., Goodfellow, B. and Light, I. (2007). Practice Based Working with Users, Carers and Support Agencies. In Myles, P. and Rushworth, D. (Eds. ), A Complete Guide to Primary Care Mental Health, Part Two London: Robinson. Attenborough, J.A. (2006). Motivational Interviewing. In Callaghan, P. and Waldock, H. (Eds. ), Oxford Handbook of Mental Health Nursing Oxford University Press. ISBN 978-0-19-856898-8. Reynolds, L. and Attenborough, J.A. (2018). Brave nurses who helped win women the vote can inspire today's leaders. Nursing Standard. Attenborough, J. and Abbott, S. (2019). The impact of Nursing and Midwifery Council revalidation on the professional identity of academic staff in a higher education institution: A qualitative study. Nursing Open, 6(2), pp. 434–442. doi:10.1002/nop2.224 . Attenborough, J., Abbott, S., Brook, J. and Knight, R.A. (2019). Everywhere and nowhere: Work-based learning in healthcare education. Nurse Education in Practice, 36, pp. 132–138. doi:10.1016/j.nepr.2019.03.004 . Attenborough, J., Reynolds, L. and Nolan, P. (2019). The Nurses That Roared: Nurses From History Who Found Their Voices and Challenged the Status Quo. Creative Nursing, 25(1), pp. 67–73. doi:10.1891/1078-4535.25.1.67 . Attenborough, J., Knight, R.A. and Brook, J. (2018). Developing and sustaining a community of practice through twitter for work-based learning. Evidence-Based Nursing, 21(4), p. 115. doi:10.1136/eb-2018-102981 . Attenborough, J.A. and Abbott, S. (2018). Leave Them to Their Own Devices: Healthcare Students' Experiences of Using a Range of Mobile Devices for Learning. International Journal for the Scholarship of Teaching and Learning, 12(2). doi:10.20429/ijsotl.2018.120216 . Attenborough, J.A. and Abbott, S. (2018). Building a professional identity: views of pre-registration students. Nursing Times, 114(8), pp. 52–55. Halse, J., Reynolds, L. and Attenborough, J. (2018). Creating new roles in healthcare: lessons from the literature. Nursing Times, 114(5), pp. 34–37. Attenborough, J. (2017). Enabling revalidation for registrants working in an education setting. Nursing Times, 113(4), pp. 34–35. Attenborough, J.A., abbott, S. and Robinson, A. (2014). How would students prefer to be assessed? Report of a pilot research study. Learning at City, 4(1)(1), pp. 94–107. Attenborough, J.A., Gulati, S. and Abbott, S. (2012). Audio feedback on student assignments: boon or burden? Learning at City Journal, 2(2). Abbott, S., Attenborough, J., Cushing, A., Hanrahan, M. and Korszun, A. (2009). Patient-centred care and compulsory admission to hospital: students consider communication skills in mental health care. Journal of Mental Health Training, Education and Practice, 4(4), pp. 26–34. Simpson, A., Reynolds, L., Light, I. and Attenborough, J. (2008). Talking with the experts: Evaluation of an online discussion forum involving mental health service users in the education of mental health nursing students. Nurse Education Today, 28(5), pp. 633–640. doi:10.1016/j.nedt.2007.09.009 . Simpson, A., Reynolds, L., Light, I. and Attenborough, J.A. (2008). Talking with the Experts: Evaluation of an online discussion forum with mental health service users and student nurses. Nurse Education Today, 8(5), pp. 633–640. POWER, C.H.A. and ATTENBOROUGH, J.U.L.I.E. (2003). Up from the streets: A follow-up study of people referred to a specialist team for the homeless mentally ill. Journal of Mental Health, 12(1), pp. 41–49. doi:10.1080/09638230021000058283 . Attenborough, J.A., Cort, E.M. and Watson, J.P. (2002). An initial exploration of community mental health nurses' attitudes to and experience of sexuality-related issues in their work with people experiencing mental health problems. Journal of Psychiatric and Mental Health Nursing, 8(6), pp. 489–499. Attenborough, J.A. and Watson, J.P. (1997). Staff Perception of Sexual Behaviour in a London Shelter for Homeless Men. Journal of Sexual and Marital Therapy, 12(2), pp. 139–146. Attenborough, J.A. (2009). Heartsounds: the Butabika Project (DVD and reusable learning object for service user and carer education and training). Attenborough, J.A., Cushing, A., Hanrahan, M. and Korszun, A. (2008). Communication in Mental Health Assessment: An Interprofessional Teaching Resource (DVD and learning object on CETL website). Other modules that Julie teaches include: mental health, problematic drug and alcohol use, use of social media. 25th International Networking for Healthcare Education Conference. (Conference) Churchill College, University of Cambridge (2014). 18th Annual SEDA Conference. Bristol (2013). Description: Presentation: Is teaching excellence just about being creative? HEA eLearning in Health Conference 2011. (2011). Third International Clinical Skills Conference. (2009).